In the winding narrow shopping streets leading to Kiyomizu Temple in Kyoto, you can find all sorts of traditional Japanese delights. Step into a shop and the vendor will offer you a tray full of samples of yatsuhashi, a typical Kyoto confectionery—thin layers of mochi wrapped around sweet bean paste. Start with the lightly cinnamon-dusted original before sampling all the other flavors—green tea, roasted sweet potato, strawberry, chocolate, and black sesame (to name just a few). Next, wander into a kanzashi (hair ornament) shop, or pay a visit to Yojiya, the famed Japanese cosmetics shop. 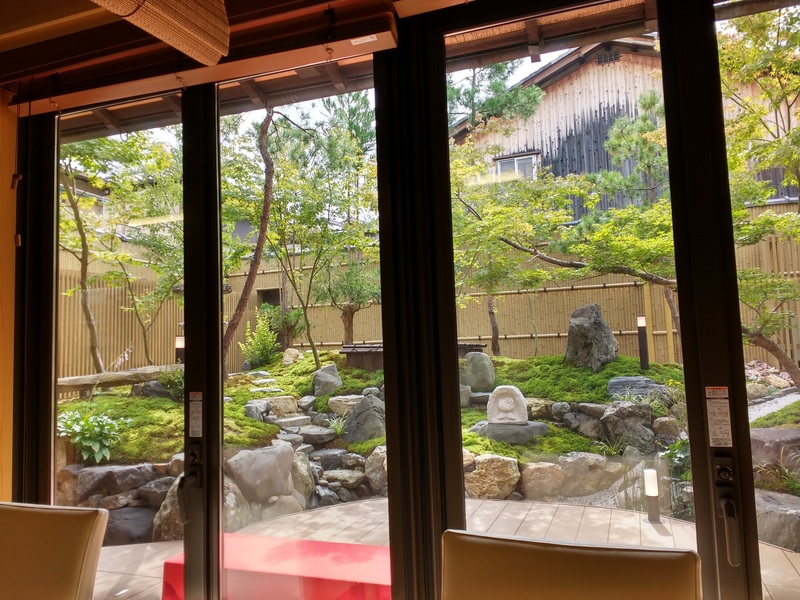 Or, if you’d prefer, the streets of Sannenzaka offer another type of traditional Japanese experience. Hello Kitty Saryo (Tea House) is like a lot of typical tea houses in Kyoto… except for the small fact that everything somehow features Kitty-chan (as she’s known in Japanese). 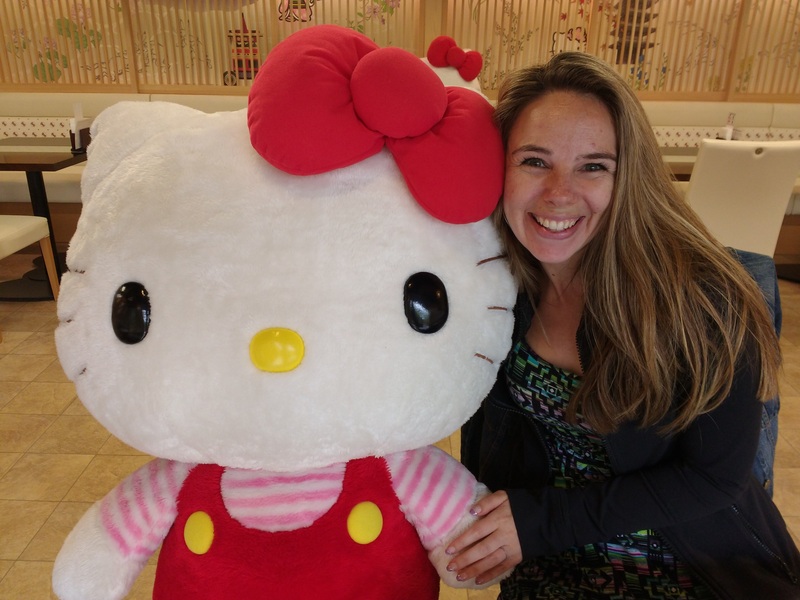 As a lifelong fan of Kitty-chan, I had to investigate Hello Kitty Saryo for myself. And what I found was actually a little surprising. I think I was expecting something along the lines of a typical Sanrio store: bright colors, lots of pink. 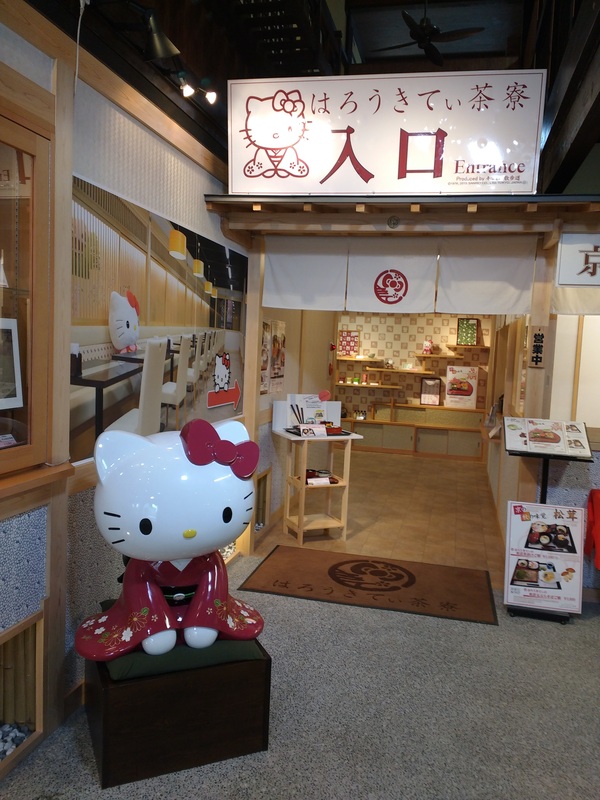 But what I found instead was a sophisticated Japanese tea salon… with just a hint of Hello Kitty in every detail. Here’s the entrance. Note the muted color palette, minimalist design, and traditional noren curtain (featuring Kitty-chan’s signature bow). I arrived soon after the shop opened for the day, so only one other table was occupied and I had my choice of seats. The host let me know I could sit wherever I wanted, so I opted to sit at one of the tables closest to the window so I could admire the garden view. Large plush Kitty-chan dolls sat at a few of the tables. There was one directly across from me, but soon after I sat down, my waitress brought it to sit next to me. She took a Polaroid photo and asked me to write a message that they would later share on their bulletin board. I also asked her to snap a shot of me and my dining companion. 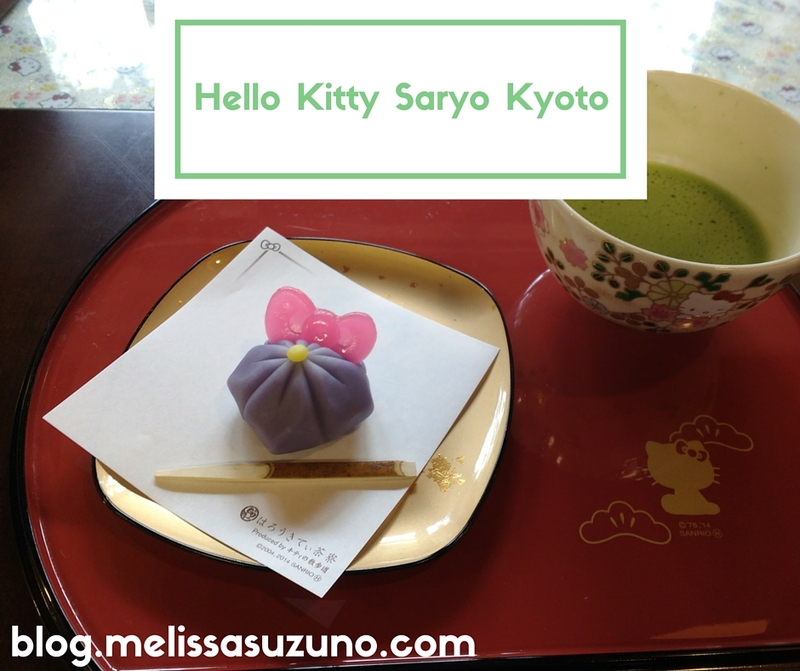 The menu at Hello Kitty Saryo includes Kyoto-style obanzai lunch plates, ochazuke (rice and pickles served with tea), Western-style pasta, and a range of tea and coffee. 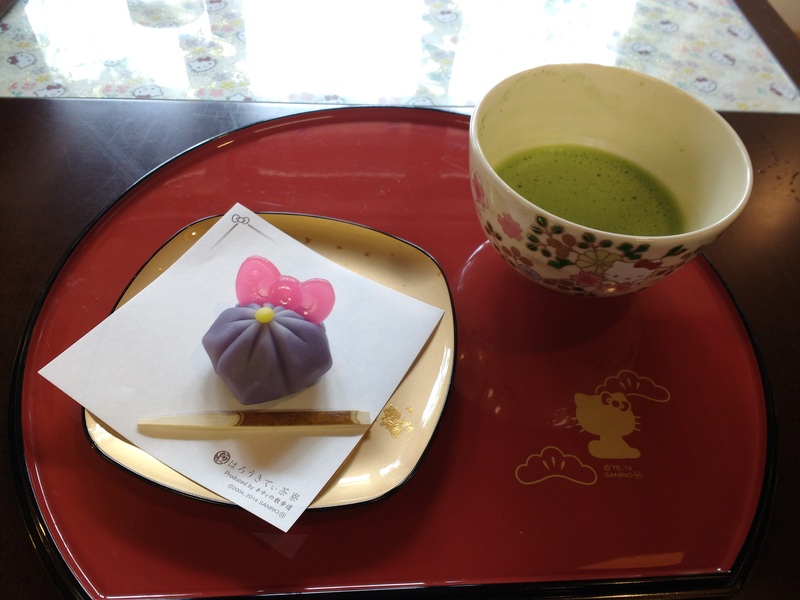 I opted for matcha (powered green tea) and a traditional Japanese confectionery made from purple sweet potato and shiroan (white bean paste). 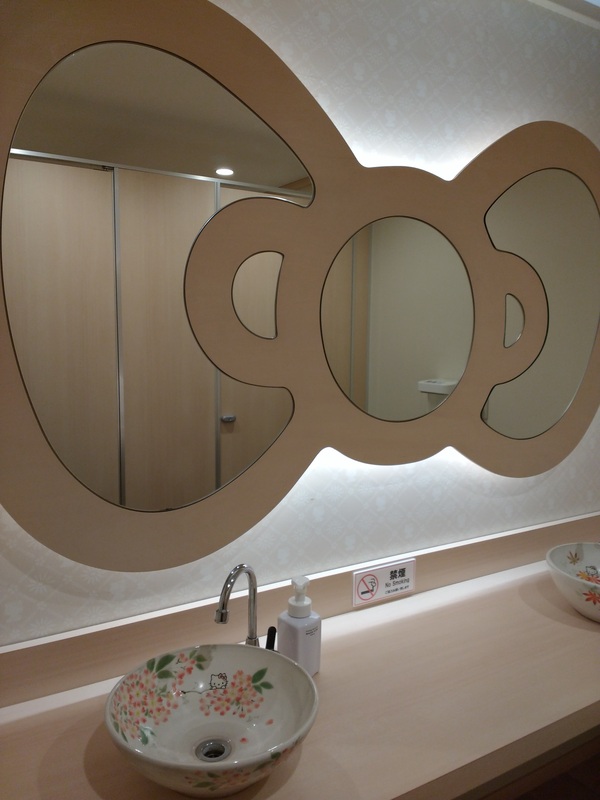 And, of course, I had to check out the bathroom. LOVE the sink basin and the wallpaper!! Once you’re done eating, you can head next door to the shop and stock up on souvenirs. They have everything—wallets, coin purses, yukata (light cotton kimono), ceramics, jewelry… the list goes on and on.